It's frustrating when your iPod gets stuck and stops responding to your clicks. You may worry that it's broken, but that's not usually the case. Everyone has seen computers freeze up and knows that restarting them usually fixes the problem. The same is true for an iPod, too. But how do you restart an iPod? If you've got an iPod from the original series — which includes the first model, through to the iPod Photo and Video, and ends with the iPod Classic — the answer is in the instructions below. First, make sure that your iPod's hold switch isn't on. This is crucial since that button can make the iPod appear to be frozen when it's not. The hold button is the little switch at the top left corner of the iPod video that "locks" the iPod's buttons. If this is switched on, you'll see a little orange area at the top of the iPod video and a lock icon on the iPod's screen. If you see either of these, move the switch back and see if this fixes the problem. If it doesn't, continue with these steps. Press the Menu and center buttons at the same time. Hold those buttons for 6-8 seconds, or until the Apple logo shows up on the screen. At this point, you can let go of the buttons. The Classic is restarting. If the iPod still isn't unfrozen, you may need to hold down the buttons again. If that still doesn't work, make sure the iPod's battery has a charge by connecting the iPod to a power source or computer. Once the battery has charged for a while, try again. If you're still unable to restart the iPod, there's likely a hardware problem that needs a repair person to fix. Consider making an appointment at the Apple Store. However, keep in mind that as of 2015, all Clickwheel models of the iPod are not eligible for hardware repair by Apple. Try the hold switch, as described above. If the hold switch wasn’t the problem, continue through these steps. Next, move the hold switch to the on position and then move it back to off. Hold down the Menu button on the clickwheel and the center button at the same time. Keep holding for 6-10 seconds. This should restart the iPod video. You'll know the iPod is restarting when the screen changes and the Apple logo appears. If this doesn't work at first, try repeating the steps. If repeating the steps doesn't work, try plugging your iPod into a power source and letting it charge. Then repeat the steps. Check the hold switch as described above. If the hold switch wasn’t the problem, continue on. Move the hold switch to the on position and then move it back to off. Press the Menu button on the Clickwheel and the center button at the same time. Hold these together for 6-10 seconds. This should restart the iPod. You’ll know the iPod is restarting when the screen changes and the Apple logo appears. If this doesn’t work at first, you should repeat the steps. If this doesn’t work, plug your iPod into a power source and let it charge to make sure it has enough power to work properly. Wait an hour or so and then repeat the steps. If this doesn’t work, you may have a bigger problem, and ought to consider a repair or upgrade. Press the Play/Pause and Menu buttons on the iPod at the same time. Hold these together for 6-10 seconds. This should restart the iPod, which is indicated by the screen changing and the Apple logo appears. If this doesn’t work, try plugging your iPod into a power source and let it charge. Then repeat the steps. If this still doesn't work, try pushing down each button with only one finger. 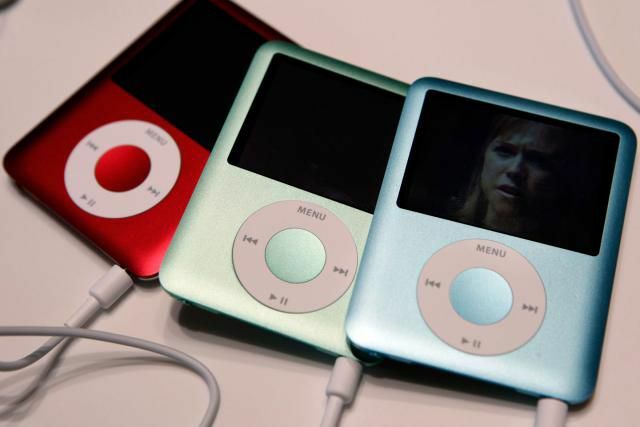 Need to know how to restart an iPod model not covered in this article, or an iPhone or iPad? Check out What You Need to Do to Fix a Frozen iPhone, iPad or iPod.